TheAngrySpark: SiriusXM announces town hall meeting with... Tony Hawk? Hawk, who hosts Tony Hawk's Demolition Radio on the broadcast service (on the Faction channel), will chat with fans about his life as a pro-boarder and his work with underprivileged communities. The panel presentation will be hosted by someone else you may know- Stacy Peralta. Peralta, also a skater, directed the upcoming (due 11/2) biopic Bones Brigade: An Autobiography. “Tony’s talent and passion have taken a niche sport and helped turn it into a phenomenon with international popularity and appeal. He has crossed the lines of action sports, gaming and music to become one of the coolest brand ambassadors of our time, not to mention one of the driving forces powering our Faction channel,” said Scott Greenstein, President and Chief Content Officer, SiriusXM. “Tony lives his life in non-stop action and listeners will get a broad look into what it’s like to be a legendary pro-skater and get an expansive look into the icon’s life without boundaries." The program should be a pretty good time, and a definite solid listen for fans of Hawk- or just skateboarding in general. And this is no flash in the pan, past SiriusXM Town Hall's have featured such entertainment bigs as Bruce Springsteen, Tom Petty, Ringo Starr, Gregg Allman, Usher, Linkin Park, and Nirvana- so it's got a quality pedigree. Look for Tony Hawk's Town Hall Meeting to air on SiriusXM on Faction (channel 41) on September 10th at 7:00pm Eastern. Don't forget either that Hawk's regular gig for satellite, Demolition Radio, kickflips onto the air on Tuesdays- same Hawk time, same Hawk channel. 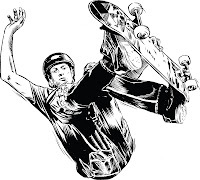 Artwork pictured is from Tony Hawk's Pro Skater HD, now available for the Xbox 360 and Playstation 3.